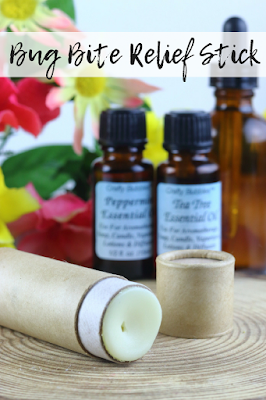 Get relief from bug bites with this natural bug bite relief stick made with essential oils. A few weeks ago, I was sitting on my patio writing and keeping an eye on the kids in the pool when a mosquito thought that I would make a nice after dinner snack. I sprayed myself with my insect repellent spray and went back to work. The bug bite really itched to the point where I was scratching it in my sleep and soon scabbed over. Within a few days, it was angry red, inflamed, and hurt. While it wasn't the worst injury I've ever had, it wasn't pleasant. It was also unsightly on my leg while I was wearing shorts or capris. Thankfully, some antibiotic cream cleared it up in about a week. But it really made me wish that it hadn't happened in the first place! I started researching natural bug bite relief with essential oils. I knew I wanted something that was soothing for the skin and antimicrobial, so I chose ingredients that would help stop an infection. Disclaimer: I'm not a doctor, nor do I pretend to be one. If you have a bug bite that's infected, go to a doctor. Don't rely on this or any recipe you find on the Internet. I wanted this recipe to have green tea, but I didn't want to use the actual tea in the recipe because it would get messy. So I infused the coconut oil with the green tea. By infusing them, I get the benefits of green tea without actually leaving the tea leaves in the recipe. Green tea is often overlooked in skin care recipes, but it's a very powerful and inexpensive ingredient. Green tea is high in catechins, which are a type of polyphenols. These catechins help reduce swelling, redness, and irritation, hence why I added it to this natural bug bite relief stick. The polyphenols can also damage the membrane of bacteria. Green tea is also high in vitamins B2 and E for your skin. Vitamin B2 promotes collagen production, and vitamin E promote skin cell turnover for softer skin. Coconut oil is naturally antifungal and antibacterial thanks to lauric acid and capric acid. It's also high in medium chain fatty acids to keep skin moisturized, and they also help the skin retain its moisture. Beeswax is very hard at room temperature, so it makes this lotion a solid for portability. But that's not the only benefit of beeswax. Beeswax is also naturally antimicrobial. It also forms a barrier on top of the skin, which helps seal in moisture. This also seals in the other ingredients. I chose peppermint, tea tree, and lavender essential oils for their unique properties. I used lavender essential oil because it's naturally antibacterial, but it's natural properties are actually enhanced when you combine it with another oil like tea tree oil. Lavender essential oil has been proven to promote wound healing in rats. It help heal wounds by promoting collage production and promote tissue formation. I chose peppermint essential oil because the menthol in it can reduce itching. It's also calming for your skin and naturally anti-inflammatory. Tea tree oil is my go to antimicribial essential oil. I also added it to this bug bite relief stick because it's naturally anti-inflammatory and can reduce swelling. I really like the cardboard push up tubes from SKS-Bottle. They are recyclable and compostable, so they don't create waste. You can also get cardboard tubes from Amazon or use a plastic lip balm tube . Infuse the coconut oil and green tea. Since coconut oil is a solid at room temperature, you have to do this over the stove or in a slow cooker. Place at least 3 tablespoons of coconut oil in a mason jar. I usually do at least a cup of coconut oil since I'll use what's leftover in other recipes. Line your slow cooker with a kitchen towel. Add several inches of water. Set the mason jar with coconut oil on the towel and turn the slow cooker on low. When the coconut oil is melted, add 2 tablespoons of green tea per cup of coconut oil. If you use less coconut oil, just adjust your tea accordingly. It won't hurt the recipe if you use a little less or a little more tea. You can use a tea bag or loose tea. One loose tea bag should have 1 tablespoon of tea, but yours might have more or less. I usually just use a tea bag because it eliminates the need to strain it later. Keep the lid off the slow cooker and let it "cook" for 4 hours. If you used loose tea, strain the herbs out with cheesecloth or use tongs to squeeze the tea bags. Discard the tea. For directions on infusing the oil on the stove, read this post on how to infuse oils with herbs. After you infuse the oils, you can use them immediately. Melt the coconut oil and beeswax in a double boiler over medium heat until the beeswax is melted. I prefer to use beeswax pastiles because they melt quicker. It will seem like it will never melt, but then it will start melting. For small recipes like this one, I use a 2 cup Pyrex measuring cup and set it on a canning ring and put that in a medium sized saucepan. Carefully remove the measuring cup from the pan. Let it cool until no longer steaming but not set up. Add the essential oils. Stir well. Carefully pour into lip balm tubes or cardboard tubes. Let cool completely before you use it. To use, simply rub on a bug bite or other itchy area. This thing is magic. My kids get a bug bite that itches so bad that they have to talk about it incessantly, but as soon as they use this, it's magically all better! Seriously though, it will help. It may not help right away, but it will help within a few minutes. Reapply as needed.